While July isn’t as busy as June, it’s still a month in which a LOT of kids are hanging out in the Children’s Department on a daily basis (except for the weekends…we’re dead on the weekends in the summer). Since I knew we’d be busy, I needed an activity that was cheap, simple, had a huge kid appeal, and was easy to stock. 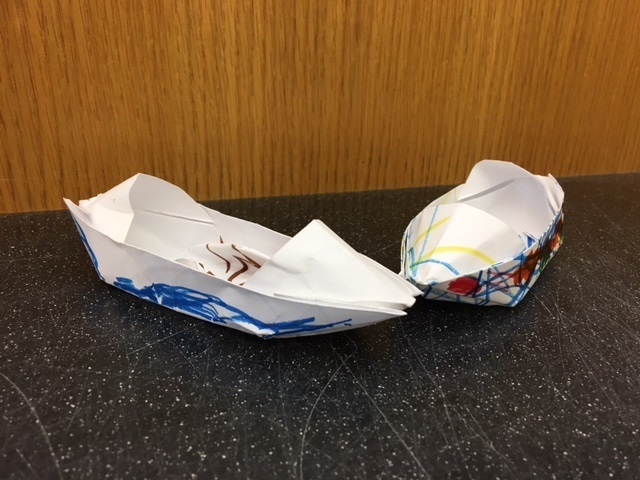 Paper folding met all of that criteria. 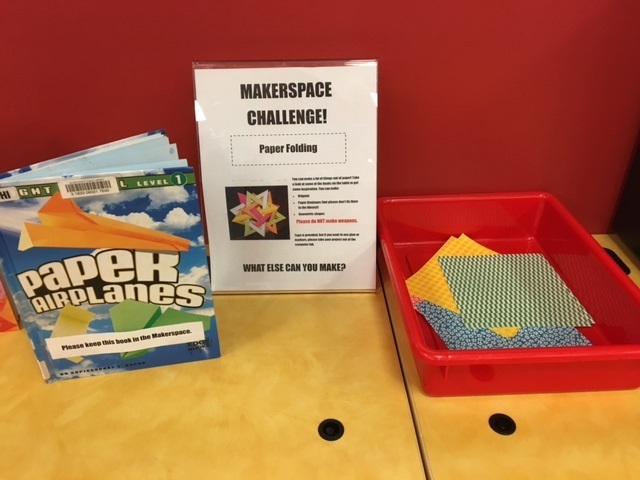 I bought some origami paper, placed some paper folding books out at the makerspace, and let the kids have at it! 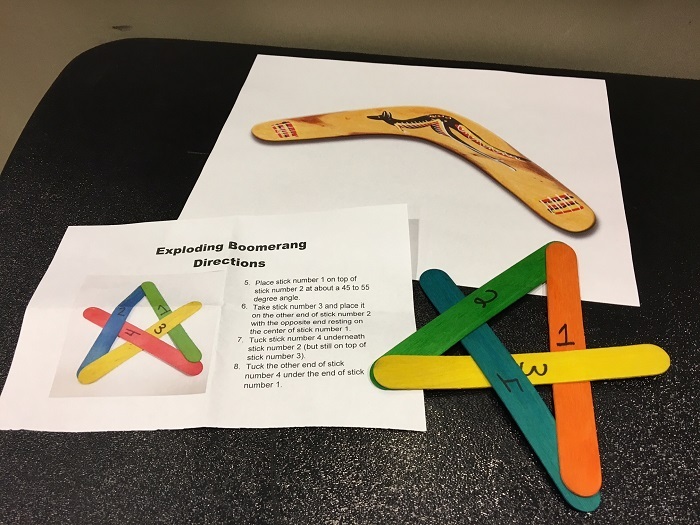 I will say that while there were plenty of kids who tried their hands at origami and paper airplanes and other forms of paper folding, there were also a lot of kids who preferred to just cut a bunch of shapes out of the paper. And that was fine with me. I was very excited for this one! 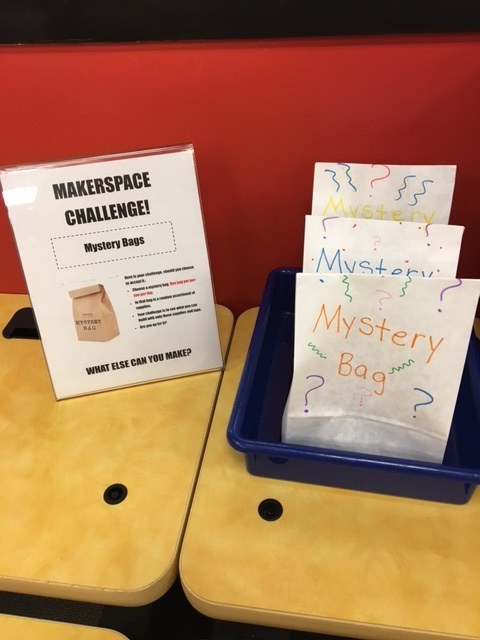 I love the idea of giving kids an open-ended challenge, and mystery bags are perfect for this kind of activity! 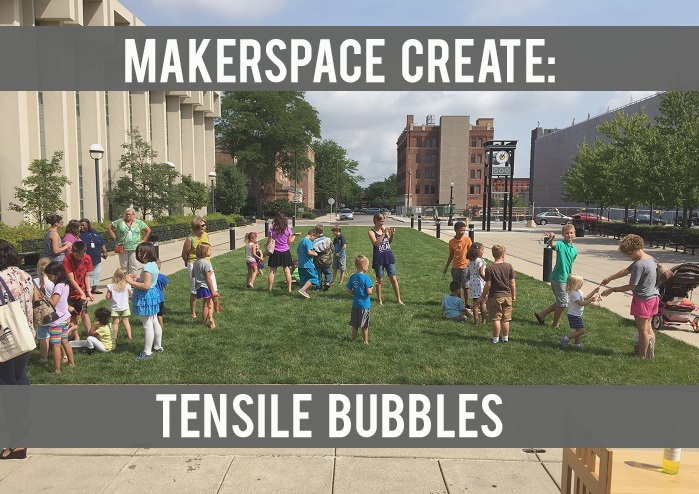 I filled the bags with a random assortment of supplies and told the kids that they could only use what was in their mystery bag + scissors + tape to create whatever they can imagine. This one was a HUGE hit with the kids! I would put three bags out in the morning, and usually by afternoon all three were gone. I even had one child in particular stop by the desk on her way out to tell me out much she liked the mystery bags. Will definitely be doing this one again. 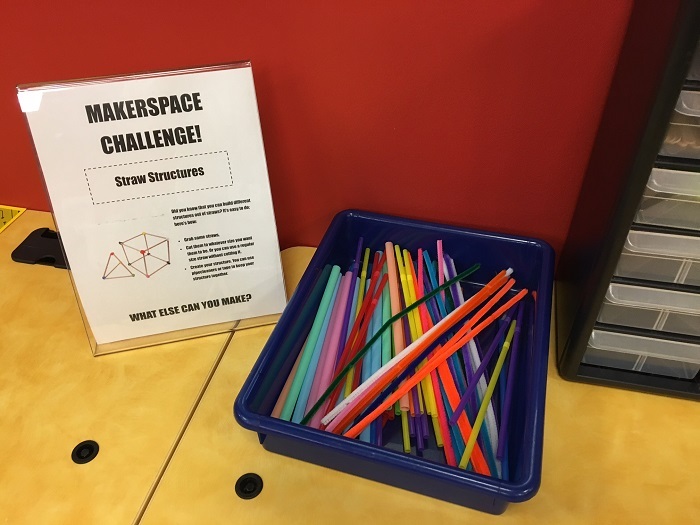 Straws are a staple in the makerspace, but the straws that we usually use are clear. For this project, I went out and bought colorful straws in a variety of sizes to make the challenge more fun. I also throw in some colorful pipecleaners as a way for children to construct their sculptures, though they also use tape when they don’t want to use pipe cleaners. I’ve been gone on vacation for most of the month (and the month isn’t over yet), so I can’t say how popular this one is, but a group of girls did make some straw pyramids, which they then put on their heads to become unicorns, so I know at least some kids are having fun with it. 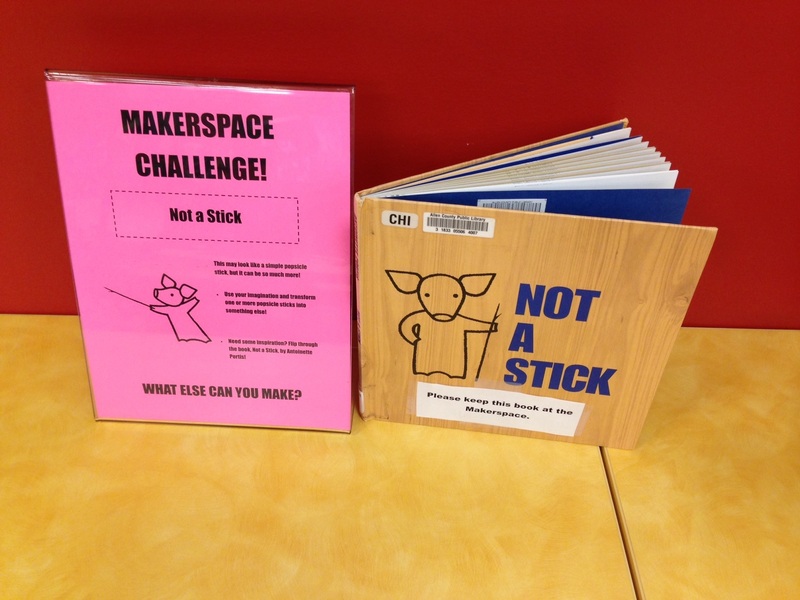 Because the makerspace is all about creativity, I left this challenge completely open. 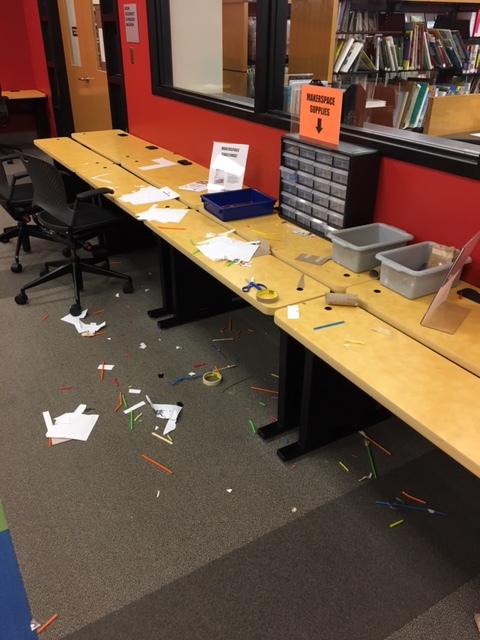 I basically pulled the book for inspiration, threw a bunch of Popsicle sticks, notched sticks, and old fashioned clothes pins into a tub, and let the kids have at it. I honestly can’t tell you if this challenge is going over well with the kids or not. May is a bear of a month for the Children’s Department. 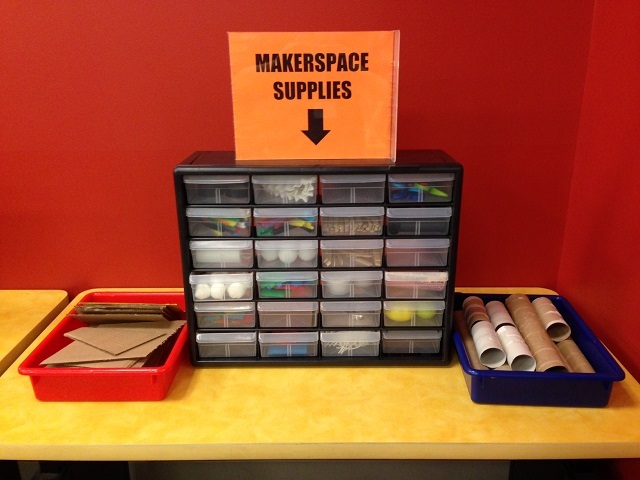 Between some vacation days and working on SRP stuff, I feel like I haven’t really had time to pay attention to the makerspace, aside from making sure that it stays stocked. 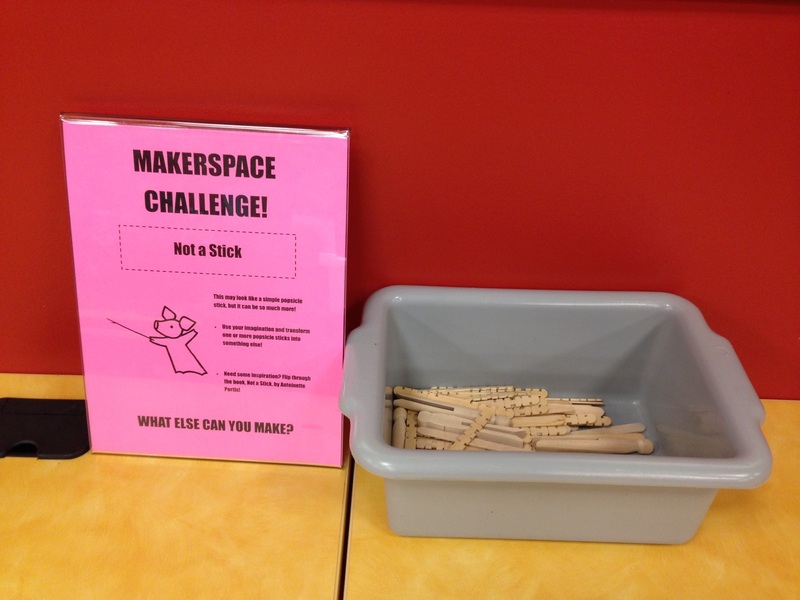 But I will say that A LOT of the Popsicle sticks have disappeared, so they’re obviously being used for something!